Steven Morales graduated from the AHRC New York City Melissa Riggio Higher Education program at Kingsborough Community College in May 2010. He now works as a film production assistant, and contributes to the important mission of a vibrant non-profit organization in Manhattan. Every parent wants their children to realize their dreams. 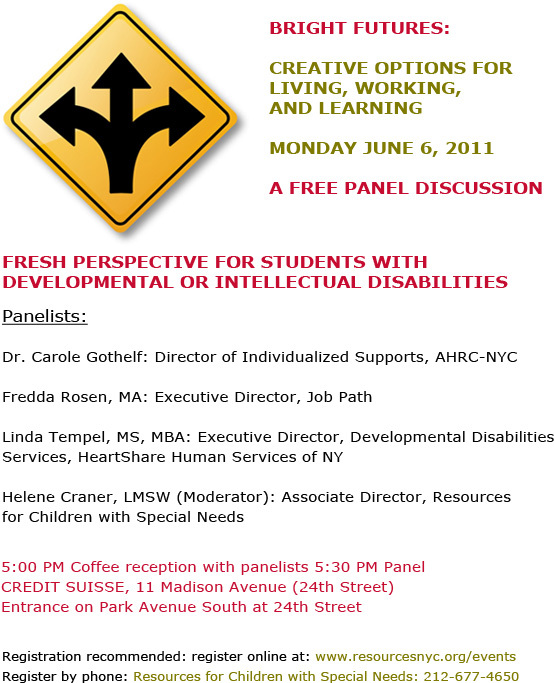 On Monday June 6, all parents and professionals have a chance to hear from leaders in the field of individualized supports about how to help their children design a meaningful life at this free event. Parents will learn how to explore and build on their young person’s passions and abilities, and design person-centered supports to help young adults live a life they choose, not one defined by their disability. This is a chance for all parents to get a glimpse of the amazing possibilities that can be achieved through person-centered planning–and to understand the public funding streams available to support this work. Steven Morales will be there to tell his story as well–together with Lisa Severino, a young staff member with the Self-Advocacy Association of New York State who has been living in supported housing with HeartShare for the past seven years, and Todd Irby-Rannair, a 2005 graduate of the Manhattan Occupational Training Center now working at a midtown law firm. Please forward to any parents or professionals you know who might need this vital information. (Printable PDF here.) The event is free, but seating is limited. Online registration strongly recommended! Registered attendees will receive a free publication at the event.